REMARKS: Attention Investors! This sale price includes 2 duplexes in the heart of Palestine! 2 Historic Victorian homes that have been converted into duplexes. 4 separate units with a total of $1550/month in income. All are currently rented. Two 2-bedroom units and Two 1-bedroom units. All stoves, window units and refrigerators convey with sale. The two houses share a driveway that leads to a large backyard parking area. Some repairs have been done and does needs some work. Selling AS-IS with no repairs. Will not qualify for FHA/VA loans. Since there are 4 tenants, property is Shown by advance appointment only! Live in one and rent the other out to help pay expenses or keep them as rent property! Fourplex/ Multi-Family Apartments for Sale in Palestine Texas! REMARKS: Attention Investors! 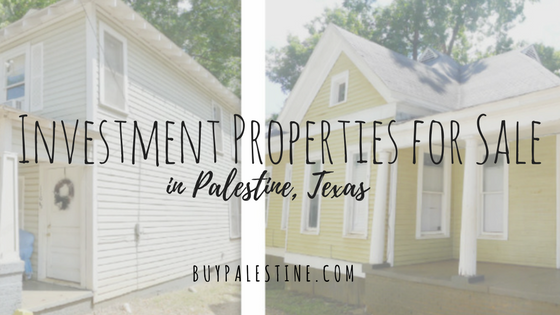 Unique investment opportunity with this 4,544 square foot four-plex that sits on a generous corner lot in the heart of Palestine. Four units consisting of three 1-bedroom units and one 2-bedroom unit. Great L-shaped wrap-around porch, built-ins and unique architectural appeal. Gross rental income is $1725/month with potential to increase rents with some updates. All stoves, window units and refrigerators convey with sale. Some repairs have been done and does needs some work. Selling AS-IS with no repairs. will not qualify for FHA/VA loans. Shown by advance appointment only. 4 Bedroom 3 Bath OR 3/2 unit and 1/1 Studio Apartment! REMARKS: Large Victorian 4 bedroom, 3 bath home on a corner lot in the heart of Palestine. Tons of square footage for the price! Step into the grand entryway of this historic charmer that features tall ceilings, hardwood floors, large bedrooms, a large kitchen, formal dining, living room, large covered porch and full size laundry room. Can be used as a large single family house (4bed 3 Bath) or utilize the mother-in-law unit for separate living quarters (with private entrance and private kitchen/bath) to make one 3 bed 2 bath unit and one 1 bed 1 bath studio unit. 2 car Garage with storage/workshop area. Majority of house has central AC/heat, installed in 2015; except for mother-in-law suite, which has window units. Several recent updates including the roof in 2012, paint, and some pex plumbing in 2015. None of these fit the bill? Search for other properties here.